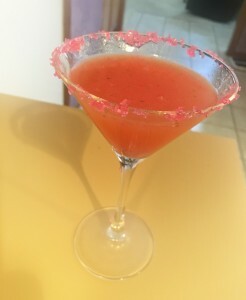 I couldn’t really come up with a catchy name, so Strawberry Cream Martini will do. 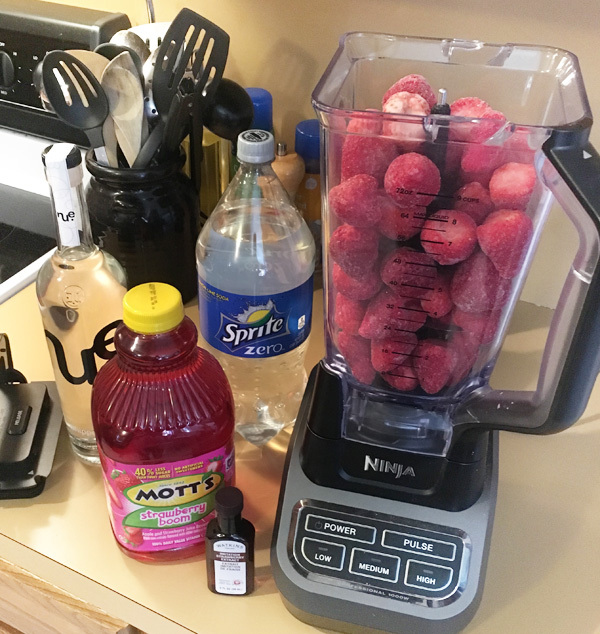 I came up with this concoction because I am lazy when it comes to following a recipe, and I have been known for several Pinterest FAILS (mainly in the food and drink category)… even when I follow the instructions! We won’t talk about the amazing biscuits that my friend made from a Pinterest recipe. I gave it try… twice and failed miserably both times. Audrey now makes all of my biscuits for me. This time, I needed a drink for a neighborhood Bunco party that I was helping host. As I read the recipes I wanted to try, I just kept thinking how good they sounded, but not very practical for a small crowd. Plus, I wanted to be able to let everyone choose whether they wanted a spiked or virgin drink. So, I threw out the recipe and came up with something that led to more ideas. Basically, I discovered the perfect “base” for whatever you want to dream up! Today I will go over the martini recipe that begins with the base. Then I will clue you in on all of the ideas that were running through my head as I put it together. You could use fresh strawberries, but when I made this they were on the expensive side. I bought the jumbo bag of frozen strawberries instead. I didn’t pay attention to the amount, but use enough to fill your blender to the top. This is a textured drink, so you want lots of fruit in it. Since I was taking this drink with me to a party, I wanted to have most of the work done. At the same time, I didn’t want it to lose its fizz. Plus, the alcohol was optional… so I couldn’t add it yet either. This is where the “base” idea began to unfold. 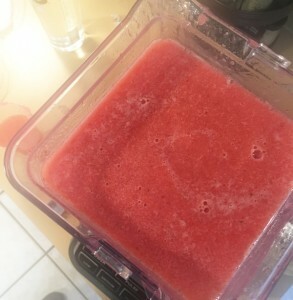 After filling the blender with strawberries, I added most of the Mott’s Strawberry Boom. I knew I would be using it all for the party, but if I were just making the base for future use, I would only add about 3 cups or so of the juice. This way you will be able to make a smoothie style drink with the base later. I also added about a teaspoon of Watkins Strawberry Extract. After blending very well, take a small taste test. You never know what level of sweet your strawberries will be. These were pretty tart, so I added a small amount of sweetener to counter that. It just depends on your taste buds really. When all blended, you will have a thick, textured strawberry juice (unless you are going for the smoothie and didn’t add as much juice). I then took the blade out of my Ninja and put the base in the refrigerator for easy transport. You could also put it in a pitcher, but this worked well for me. When I packed my bag for the party, it contained the blender full of strawberries and juice, A large Sprite Zero, the whipped cream vodka, and the pink sprinkles to garnish the cups. I would rather use martini glasses like I used for the example, but plastic cups worked better for a Bunco party. Plus, I don’t have enough martini glasses for a large group. This is pretty simple. For my samples, I used a course sugar, but at the party I used a finer sugar sprinkle and I think I like how they turned out a little better. All you need to do is have a small plate with a very wet paper towel and a small plate with your sugar sprinkles. 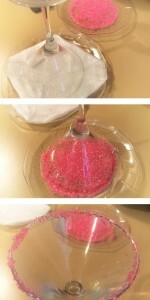 Dip the rim of the glass on the wet paper towel, then on the sprinkles. I move the glass around a bit to make even coverage. I never do get mine perfect, but when it is all done it still looks nice. Now, once at the party, I prepared the glasses and as people arrived I fixed their drinks according to their wishes (spiked or virgin). I just eyeballed the amounts, but to put it on paper, I would say a shot of the flavored vodka (1 1/2 ounces), 1 part juice mixture and 3 parts Sprite Zero (or the like). This is for an 8 ounce cup. If it is a larger glass, you will want to make adjustments. I am happy to say, the crowd loved it! Fruity, not too sweet and festive. We had a fun Bunco party and I made lots of new friends in my neighborhood. I know there will be more fun to come. Cheers! Start with the Base mix with the whole amount of Mott’s mixed in. Stir and garnish with a strawberry slice if desired. Now, the base got my mind going. I am all about making things ahead of time to limit the amount of dishes I get dirty. So if I just wanted a martini today, I could use the extra stuff tomorrow for a strawberry daiquiri… or a strawberry margarita. The possibilities are endless! This is where you would decide not to add all of the Mott’s juice at once. Keep it thick, pour it in ice cubes, and freeze it for later! Then, who knows? Add a banana, rum, whatever you fancy! I will follow up with tested recipes once I have had a chance to test this out. Give me your ideas. I know your brain must be swirling like mine… surely I am not the only one! Please comment below.